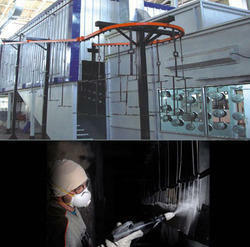 With our rich industrial experience, we hold expertise in offering Enclosed Pre-Treatment Section. Additionally, we offer these products at affordable rates. CP JetCure GP is an environment friendly, solvent free curing compound based on specialised inorganic materials. It hardens and seals cementitious surfaces, improving its abrasion resistance. CP JetCure RB90 is a ready to use membrane forming curing compound based on specially selected hydrocarbon resin. 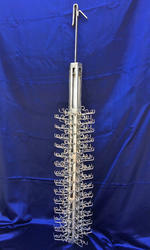 • : Deposition also in bore holes, slots etc. We undertake a range of special coating and Surface Treatments particularly developed for a special purpose on demand. Surface TreatmentAequs offers special processing capabilities through its group company, Aerospace Processing India Pvt. Ltd (API). API is a joint venture between Aequs and Magellan Aerospace of Canada and is located in Aequs SEZ, Belagavi, Karnataka, India..
Aequs offers special processing capabilities through its group company, Aerospace Processing India Pvt Ltd. API is a joint venture between Aequs and Magellan Aerospace of Canada and is located in Aequs SEZ, Belagavi, Karnataka, India. The company provides aerospace surface treatments that are not readily available in India. A wide range of Surface Treatment products for Civil Engineering application, like mould release agent in concentrated & ready to use products. FAIRCURE range of products include chemical based, wax based & resin based curing compounds to give effective curing of the concrete. Carclo Technical Plastics supplies a wide range of coatings and treatments to the surface of plastic components to impart special properties, decoration, improved wear, and increased performance. Polymers (commonly used plastics are also polymers ) have become indispensable to our daily life. It is relatively easy to manufacture intricate and attractive articles from a variety of plastics on mass scale economically. Polymers are engineered to meet specific technical requirements. We do different surface treatment on fabric, like Oil, Soil and water repellent. To keep your textile in good with this special treatment.